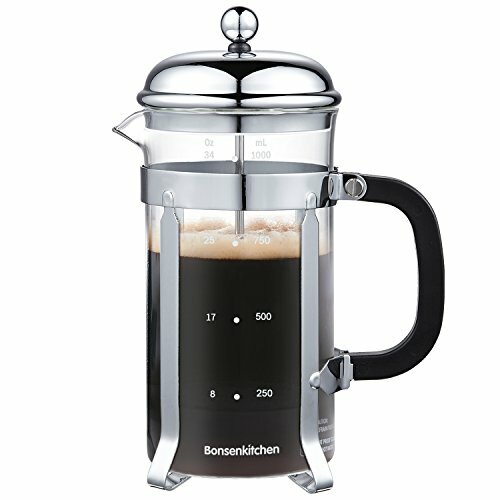 If you want a quick cup instead of doing a whole pot of coffee in the coffee maker or a better taste coffee than instant coffee, Bonsenkitchen french press excels at this task. Bonsenkitchen Coffee Maker is made of borosilicate glass that keeps coffee a nice taste and unique three-screen system creates a strong filter for smooth ground-coffee. You can not imagine how simple and fast to brew a cup of coffee or tea.It is borosilicate Glass made to withstand the high heat of the water and daily usage. Compared to paper filter, Bonsenkitchen strong removable filter is made of metal SUS 304 which will not get rust after hand-wash. It also can be cleaned in dishwasher. Twist the screw to get glass jug out of cradle, then you can wash the glass jug easily.Bonsenkitcen Glass jug replacement is also on sale and all provided with a 12-month guarantee. Take no risks of buying a french press and enjoy a new style life! If you have any questions about this product by Bonsenkitchen, contact us by completing and submitting the form below. If you are looking for a specif part number, please include it with your message.